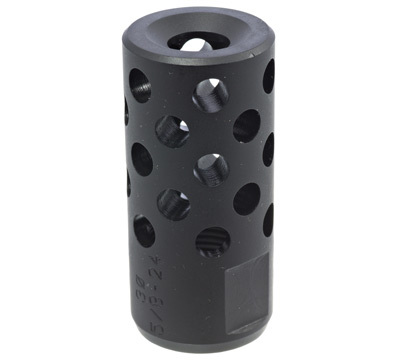 Muzzle brake is designed to reduce recoil and muzzle rise for improved control and quicker follow up shots. 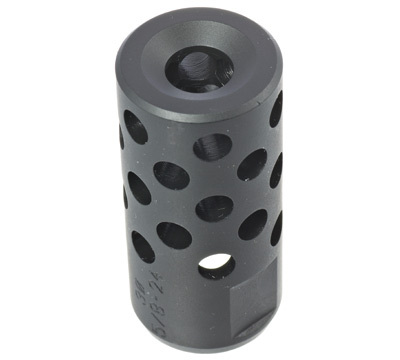 Machined from steel, this muzzle brake fits .308 caliber Scout Rifles with 5/8-24 muzzle threads. Made in the USA. Installed this on my ruger ranch 7.62x39 fit and finish were near perfect. Great product from ruger as always! It was hard for me to tell from the photo how large this muzzle brake is. I was pleased to see that it is very compact, smaller than the flash hider that came on the rifle, measuring about 13/16 inches in diameter by 1 3/4 inches long. My impression is that the recoil is reduced about 50%, which is very nice. The noise is less than I expected but certainly louder than with the flash hider. As one of the other reviewers wrote, the finish does not match the barrel but it does not look at all bad to me. Overall, it works well and is small enough to maintain the scout rifle character. I think Ruger got it right with this one. Great recoil reduction, really tuned my groups down as well, but the blast is enough to be felt in your sinuses. I made the life changing mistake of pulling the trigger on a caribou without ear protection on that rung my bell and left me with ringing ears for a couple of days. Reduced recoil is great, but not at a slap in the face every time you pull the trigger price. I really like my Gunsite Scout .308, but boy did it leave me sore after a few dozen rounds. 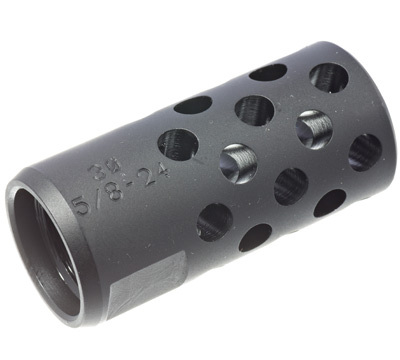 I decided to try this muzzle brake even though the first review I read didnt sound all that great. I used a #60 torx and jury rigged clamp to remove the flash hider, and screwed the brake on and only torqued it about 50 lb/ft. I took it to the range this morning and WOW! what a difference in recoil. I wish I had brought more ammo to play with. The recoil was a gentle shove, like a .223 or a 30-30, not the sharp kick of the stock 308 rifle. Definitely a good addition to a good gun. I installed this muzzle brake on my Scout rifle; the installation was very easy. The recoil reduction was noticeable, as advertised; the increase in muzzle blast was also noticeable. But, the muzzle brake is blued. The barrel of the rifle is parkerized. This is no big deal except it shows that Ruger is not paying attention to detail. In general, the brake is too expensive not to match the barrel.